Recipes with bread especially pizza, is something which can be made in a short period of time. 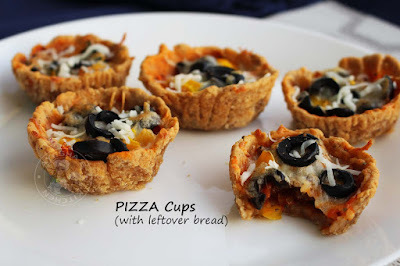 So why can't we go for a yummy bread pizza cups with left over bread. Bread pizza is a quick and kids friendly snack recipe. Whenever my kids asks for making pizza, i go for bread pizza recipe and they too loved mini bread pizza. You can make pizza with whole bread or with bread crumbs or can even with a bread pizza base. I do always for for less mess snack recipes but should looks inviting. Kids always love simple but attractive recipes for breakfast, lunch box and even for dinner. As i do have a picky eater, i often try something special to feed my kids. And this pizza cups is one among those tried and succeeded recipe. Do let them happy with this lovely breakfast pizza. You can make variations in the fillings to suit your taste. You can add more vegetables or even meat like ham, pepperoni as well. Here am with mini pizza cups, which is yet another variation in bread pizza recipe. My family loves to have bread and so i always have a stock of bread slice. But what to do with the sides of the bread slices? I often turn them into bread crumbs.Still what to do with these bread crumbs? Don't worry. 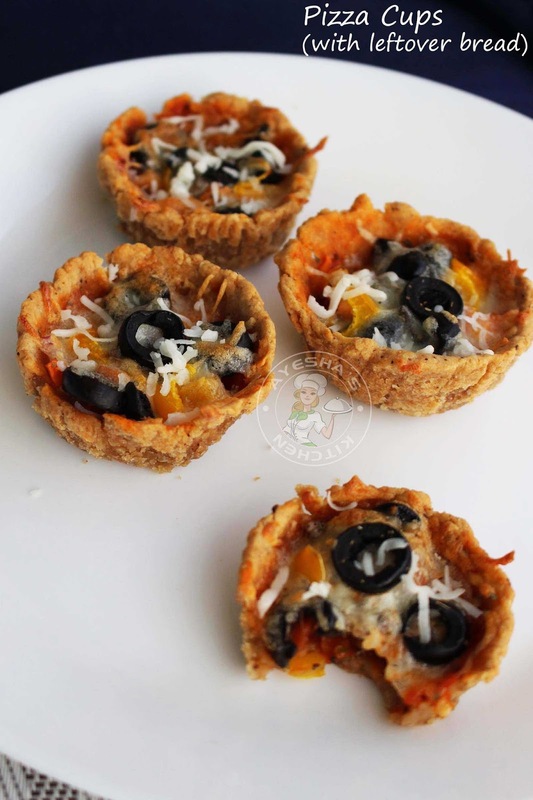 Here is the recipe for bread pizza cups with bread crumbs. This recipe calls for simple ingredients and am sure you can satisfy your pizza craving kids with this yummy treat. Here is the recipe showing how to make pizza cups with bread crumbs / easy pizza recipe / pizza crust with bread /french bread pizza /bread pizza oven / pizza cups with leftover bread / leftover bread recipes. Add the leftover bread sides or bread in a grinder and powder it. Add this bread crumbs to a bowl along with salt and pepper. To this, add few table spoons of milk little by little and make a dough (do not add more milk). Now shape this dough into small lemon size balls. Flatten slightly. Now spray or grease the paper cups (preferably with butter) and grease below the flatten balls. Take a muffin mould and keep this greased paper cups. Place the greased flatten balls inside the paper cups, shape it like a cup with your fingers. Keep it refrigerated for 5 minutes to set. Meanwhile chop the vegetables. Here i used carrot, onion, olives, bell peppers only. You can also add cooked corn, mushroom, or shredded chicken as the fillings. Now take the prepared cups, spread pizza sauce, sprinkle oil over it, add veggies one by one, again sprinkle some pizza sauce, sprinkle oregano and top it with shredded cheese. You can add more cheese and more veggies as per your preference. Bake it for 10 - 15 minutes OR until all sides become golden and crispy at 180 degree C .